The oft-touted $3.3 billion cost of congestion in Toronto is a farce. In my last column, a passing remark I made about the artificiality of the big numbers we throw around regarding the “cost of congestion” was met with some resistance. I didn’t understand there are real costs to congestion, detractors suggested. This is an important topic that merits a full response. My point was two-fold. First, those numbers count a lot of “lost productivity” that is not actually lost. Second, those numbers focus our attention on people who are already moving but stuck in car traffic. Instead, we should focus on the lost productivity of those who are not moving at all—that is, those who are unable to participate in the city’s economy because they can’t get where they need to go. So, what do those big numbers mean? Interestingly, the report found a much greater toll from pollution, estimating it cost Ontario’s economy $7.8 billion “in lost productivity, health care costs, pain and suffering, and premature loss of life.” It estimated there were 440 premature deaths annually due to pollution. The report named many culprits for Toronto’s productivity problems: traffic congestion due to overreliance on private cars, railway capacity that was pathetically low, poor regional transit integration, underdeveloped public transit, and the worst federal government support for transportation in the OECD. There were also observations about the need for affordable housing and better support for immigrants. But that $3.3 billion “congestion cost” figure stole the headlines. For instance, CBC equated this “congestion cost” to “lost productivity” in a November 2009 story. How did the OECD calculate that $3.3 billion number? For the most part, it came from a 2006 Transport Canada report [PDF], which calculated its congestion cost by measuring time added to commutes during the peak-hour from “recurrent” traffic problems due to traffic volume and road design. It did not include extraordinary events, such as collisions or extreme weather, and looked at passenger cars only, not delivery trucks. The value of that lost time is based on previous surveys of how much traffic is work-related and how much is not. A Toronto survey in 2001 found 55 per cent of our private car traffic was work-related and 45 per cent was for other purposes. Work-related travel was then valued at $30.86 per hour; other travel was valued at $9.50 per hour (in 2002 dollars). I think these figures are artificial for several reasons. Not all of those people wind up late for work. Plenty of commuters factor traffic jams into their travel plans and allow extra time to get to work. The Transport Canada report cites research showing commuters accept this (to a degree). Many of those who are late make up any lost time during lunch breaks, staying later, or bringing work home. They didn’t see their pay docked by $30 per hour for lateness. The workday may be disrupted for that worker and possibly co-workers, but tasks do not go undone that day because of traffic. And many tasks that go undone in a given day, such as deliveries that cannot be made before an office closes, are rerouted to the next day. The numbers measuring the value of our time are almost arbitrary. What’s your time worth to you? There are definitive factors we can use to justify such numbers, such as an average hourly wage, but that’s very inconclusive for measuring a cost that is often qualitative, not quantitative. And if what we are concerned about is time, then the “congestion cost” of 10 minutes stuck in traffic is no different than living 10 minutes farther away from your job. Nor is it any different than when a bank moves an office from downtown to the suburbs and increases its employees’ commutes, even if those “reverse commutes” experience less traffic congestion. If time stuck in a car is unproductive, it is unproductive at any speed. Yet we don’t count commuting distance as a cost or lost productivity. This doesn’t mean getting caught in traffic doesn’t have additional costs. Are there ever tasks that go undone, opportunities entirely missed, productivity entirely lost because of traffic (or a delayed subway train)? Yes, absolutely. This is also the result of sick days, office reorganization, and so on. Does this amount to billions of dollars in “congestion cost” or “lost productivity” due to car congestion? No, it does not. Commuters don’t lose that money; they lose time. And the Transport Canada number does not include the commercial traffic—the missed deliveries, extra trucks, overtime pay, and so on—that might actually incur a cost or lost productivity. What the big number does is put a satisfying, comprehensible dollar value on the frustration of sitting in traffic. It is reasonable to want to measure and shout about the “expense” of traffic because when you are trying to get somewhere, and the journey itself is not enriching your life, standing still is indeed a waste of time. 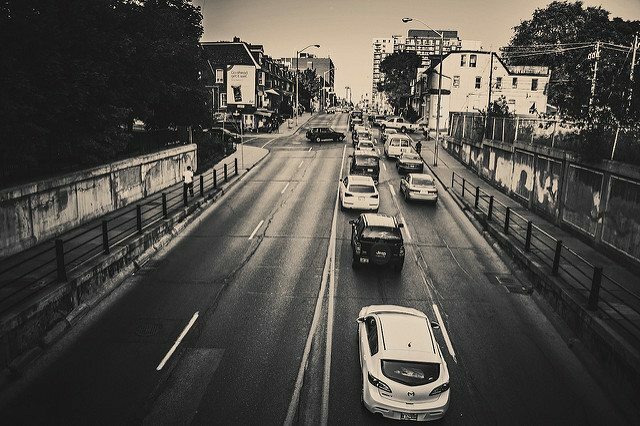 Nevertheless, it is neither reasonable nor productive to frame the argument the way those billion-dollar figures do: in lost productivity that often isn’t lost, a focus on people in cars as the only form of congestion, and no discussion of the commuting distances produced by the nature of suburban development. Most importantly, in a conversation that is supposedly about lost productivity, there is no discussion about the people who are not able to participate in the economy because they can’t get there from where they are. That is actual lost productivity. The people who cannot participate are often those whose economic and social needs are greatest. The good news is that this is not the only way to measure the cost of cars and other modes of mobility. More recently, Danish researchers measured the cost of using a car per kilometre, by assessing its impact on society, including the cost of traffic accidents and health effects. These numbers and what they measure—and what they do not measure—have an impact on the way we think about moving people around the city and the decisions we make to try to make it better. For example, we talk about money and not deaths from air pollution. In fact, congestion isn’t always bad. When we allow “congestion costs” to only represent cars, we miss how congestion (volume of people) on public transit does not necessarily cause delays or incur other costs. It just moves a lot of people where they need to go, and that’s great. The “congestion cost” numbers we use often don’t give us very meaningful information, and they leave out many things we need to be thinking about. Let’s not let them frame the discussion about productivity. CLARIFICATION: This story has been updated to clarify that comments from detractors were paraphrased and not directly quotes. Torontoist regrets the error.